Coming from the Latin word for “within the walls”, Intramuros was a Spanish riverside walled city- surrounded by moat- built on the site of a fortified Malay Islamic settlement called “Maynila”, a name referring to the nila mangrove plant (Scyphiphora hydrophyllacea) that once thrived along Manila Bay. City planning was commenced by Miguel López de Legazpi, the conquistador who established the Spanish settlement. First constructed with wood and earth, the ear-shaped fortress was later strengthened with stone and mortar from 1573 to 1606 against native uprisings and invasions by Chinese pirates. Intramuros was the political, military and religious center of the colony. And only Spaniards and mestizos were allowed to engage in business and reside within the walls. Tragically during WW-II the entire city was shelled by American forces to flush out the remaining Japanese soldiers, killing over 120,000 citizens in the process. Only San Agustin Church was left standing. In the postwar years, Intramuros was slowly restored, especially during the Marcos administration, but never regained its former glory. Bones from a grand and tragic past can be picked up from the restored and reconstructed edifices: massive cannons peering through the bulwarks and ramparts; Baroque and Romanesque churches, old-world bahay na bato, and the crumbling beauty of ruins – all silent witnesses to the beautiful, victorious and painful history of Manila. • Hop off the Pasig River Ferry at Plaza Mexico Station, and walk past Plaza Mexico, Plaza España and the crumbling skeleton of the Intendencia (aka Aduana), a customs house during the Spanish period converted into the Central Bank during early 20th century. 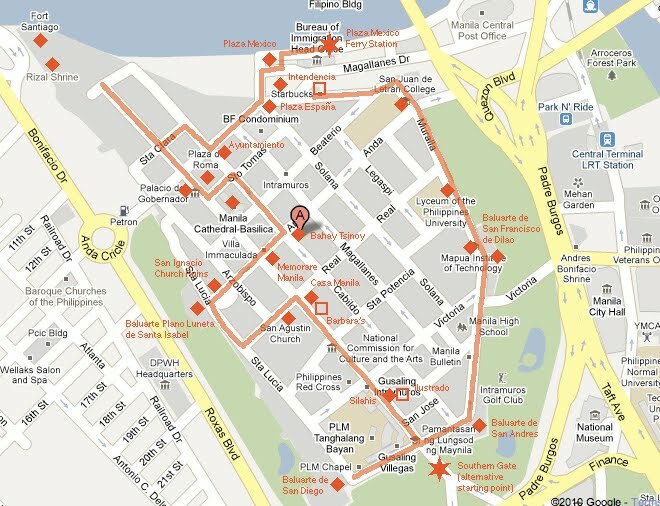 • Proceed to Fort Santiago – the most beautiful (and touristy) area in Intramuros. Entrance along Sta. Clara St. Take your time enjoying a kalesa ride, visiting the Rizal Shrine, retracing the golden footsteps of Rizal to his demise, and walking along the bulwarks by the Pasig River. • Head down to admire the fountain at Plaza Roma, surrounded by Ayuntamiento (city council building) ruins, Palacio de Gobernador (governor general’s office) and Manila Cathedral (Cathedral-Basilica of the Immaculate Conception). • Walk down Cabildo St. to Bahay Tsinoy (entrance fee: PHP 100) – a museum that relives the history of the Chinese and Chinese mestizos with life-size dioramas. • Turn right at Anda St., passing by Memorare Manila in honor of the over 120,000 civilians killed during World War II. • Walk down towards Baluarte Plano Luneta de Santa Isabel, passing by the San Ignacio Church ruins (under restoration). • Strolling down Sta. Lucia, turn left Real to see the San Agustin Church & Museum (museum entrance fee: PHP 100) – the oldest stone church declared a UNESCO World Heritage Site in 1993. Note the missing bell tower (destroyed by an earthquake), intricately carved doors, Chinese lions (church artisans were Chinese) and amazing trompe o’l’oeil interior murals. Don’t miss the tomb of Miguel López de Legazpi, located on the left side of the church altar. • Across the street is Casa Manila (entrance fee: PHP 75) – a Marcos reconstruction of a Spanish residence that showcases exquisite interiors – and Plaza San Luis where one can dine like a mestizo at Barbara’s. • Continue walking down Gen. Luna St to Silahis Center – one of the best antique and handicraft stores in town (and the perfect place to cool off after a long walk!) – before relaxing at Ilustrado for a unique gourmet treat: sampaguita ice cream, made from the national flower! • At the end of Gen. Luna St. is the southern gate, turn right to visit the gardens and garrisons of Baluarte de San Diego (entrance fee: PHP 100) facing Rizal Park. • Backtrack along Muralla St. and walk up the eastern walls at Baluarte de San Andres for great views of the golf course (formerly the moat), Manila City Hall and Lawton area. • Enjoy walking the wall towards Baluarte de San Francisco de Dilao passing by the old academic institutions of Mapua and Lyceum to your left. • Walk the remainder of the wall towards San Juan de Letran College. Descend to the street, and end your walk by rewarding yourself with a Frapuccino at the cozy Starbucks built into the old fortress, before hopping back on the river ferry. 2. Keep an eye on your belongings – watch out for touts, beggars and pickpockets! 3. Be vigilant! Beware of scammers: never ride in a stranger’s vehicle, or accept drinks from them. Exploring Manila on foot is as safe as any other highly urbanized capital, however a criminal group known as the “Ativan Gang” scouts tourist districts to befriend, drug and rob careless travelers. Report suspicious persons and/or untoward incidents to the police and your embassy immediately. 4. You can start the walk from the southern gate along Muralla St, where jeepneys from Binondo and Quiapo drop off passengers. Taxis may also drop off passengers here. 5. For guided walks of Intramuros, look for Carlos Celdran. Rates: PHP 900 for adults, PHP500 for students. Tsk, haven’t done this yet. Thanks for sharing! Gotta join one of Carlos’ walks someday. Hi Edgar, Maayong gabii from Cebu! I would be visiting Intramuros this Saturday (i.e., if the weather would be favorable) and I’d be following this DIY guide too. Question lang, what’s the cheapest way to get to Plaza Mexico Ferry Station? I would be dropping off at LRT1 Central Station btw, straight from NAIA3. Or can I just walk my way from the station to that starting point? Hi baktin, sorry for the late response. The best way to reach the Plaza Mexico station is to alight at LRT-1 Central Terminal, walk to Manila Post Office and catch a jeepney to Intramuros along the river.